In this article we review iPage Hosting, their plans, features and much more. We begin by covering a few pros and cons before looking closer at their client support; all in an attempt to decide if this is the right host for you. Our final verdict ties together several important factors for consideration before choosing the right host for you. Let's begin with a few pros and cons of iPage Hosting. Should you use iPage Hosting? If you are price sensitive, but still want to get your ideas online, then iPage is the host for you. With an array of affordable hosting options in shared, VPS and dedicated hosting plans, you will be sure to find the one for your website. What are the Pros & Cons of iPage? Strong uptime – iPage provides a very strong uptime of 99.98%. iPage boasts that they provide 24/7 monitoring, which means that if a server is down, they begin working it immediately. With such great technical support, it’s no wonder that their uptime percentage is the same as hosting giant HostGator. Transparent pricing structure – If you’re not yet aware, many hosting companies display a price on their website which gets you all excited till you check out. It is common practice for companies to lock you into a 2, sometimes 3 year contract which is payable upfront. iPage on the other hand offers transparent pricing with a minimum of a 1 year contract. This transparency is great as it avoids many hidden costs. Money back guarantee – If you would like to give their service a test run, you will have 30 days to do so. This is a great plus as you will be able to test functionality, uptime and ease of use during this period.As mentioned before, iPage has great transparency and when they say 30-day money back, they mean it. If you are unhappy with their service, their no questions asked money back policy will have you on your way in no time. The same cannot be said about some competitors where sophisticated wording more often than not stands in between you and your money back guarantee. Price – iPage Hosting provides great pricing all-round, from their shared hosting to dedicated hosting plans are affordably priced. iPage Hosting's cheapest offering starts at just $1.99 per month.The greatest thing about their pricing we think is the fact that their displayed price is standard regardless of the period. What that means is, whether you want to sign for 3 years or 1 year, the monthly price remains the same. Great security features – SiteLock security suite is an addition to every iPage hosting plan. By completing regular security scans, SiteLock acts as a preventative software against malware and other malicious security risks to your website. Domain price – This con only applies if you request a money back within your first 30 days. iPage does offer a free domain name, however, if you were to request your money back, this domain name will cost you a $15 deduction on your refund. Renewal costs – You may very well enjoy the great pricing when you sign up with iPage Hosting, but when you renew your contract, expect your costs to increase in a big way. Renewal costs are said to increase by up to 350%. This increase is reasonable if you’ve taken out a 3 year plan, but if you’re renewing a 1 year plan, this is a rather steep increase. Page load times – Good page loading times will be below 500ms. iPage sits rather far from this at an average of 820ms. We’ve listed this as a con because although this load time is still slightly under the industry average, it does affect SEO, ranking and user experience in a negative way. Slower websites are ranked lower and users are more likely to be impatient with slow loading times. What hosting plans and features does iPage Hosting offer? iPage Hosting provides four hosting types depending on your needs. These hosting types are shared hosting, VPS, WordPress and dedicated hosting plans. Shared hosting – iPage takes a one-size-fits-all approach to shared hosting. This is a great option for static websites with low traffic volume and light storage content. Shared hosting is largely aimed at those websites starting out and expect to scale in time. WordPress hosting –If you are looking to host a WordPress website, then iPage WordPress hosting may be for you. iPage Hosting have designed plans to optimize WordPress websites with pre-installed plugins and themes which have been hand-selected as well as a control panel which has been fully customized. VPS Hosting – VPS hosting provides a solution if you require more resources as well as a guaranteed memory allocation. VPS hosting is a great option for those websites that experience medium to high volumes of traffic and who also require a larger storage allocation. iPage offer VPS plans which allow root access so that you can customize your hosting environment and install necessary software. The guaranteed memory is a great way to maintain optimal speed and reliability as well. Dedicated Hosting – Dedicated hosting plans are for those that are hosting large amounts of traffic volumes and require lots of custom applications. iPage provide plans which give you complete control of your environment; optimum speed and security will also be enjoyed as no resources are shared. What is iPage hosting's Customer Service like? Customer service experience is relatively good when dealing with site issues. They offer several lines of support to their clients through live chat, telephone and email. The support staff seem relatively knowledgeable when it comes to common issues, however we are unsure what the support is like with more technical queries. iPage offers several hosting plans which suit a variety of needs.Their range of hosting plans begin at shared hosting and range all the way up to dedicated hosting. If you are starting out and are in need of great pricing, then iPage is for you. At $1.99, it is a great way to take your ideas online. 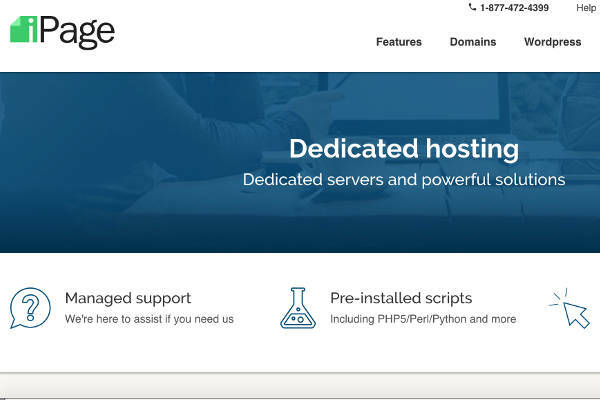 iPage also provide great plans on the dedicated hosting front, however we feel that you will get more value from their competitors when it comes VPS and WordPress hosting deals. In terms of shared hosting, an important consideration is the plan period. Although the initial price is great, their renewal price is rather high. If you are looking for a one year plan, we recommend looking at an alternative like BlueHost or SiteGround; however, if you’re looking to commit to 3 years, then the renewal cost is not so dramatic.